Christopher Hill is a founding member of the New Zealand Guitar Quartet and the Wellington Guitar Duo. He has toured extensively throughout the country with these groups for numerous Chamber Music New Zealand concert seasons and will be included in the 2015 CMNZ season and an ‘Arts on Tour’ series this year. 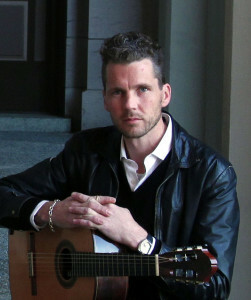 In addition to classical guitar performance, Christopher specialises in the transcription and techniques of Latin and flamenco music. He has travelled to Spain in recent years to study and perform. He featured as the flamenco soloist with the New Zealand Symphony Orchestra in the 2014 New Zealand Festival performance of the Spanish themed opera Áinadamar’. Christopher has had a rich and varied musical past. He brings to his performance influences from pop and jazz, utilising his improvisation and composition skills. He is interested in new music and in advancing the musical possibilities of the guitar while actively collaborating with contemporary New Zealand composers. Christopher was recently invited to arrange, record, and perform music written by renowned composer Jack Body for a lifetime achievement concert with the New Zealand String Quartet. All ages from 5 years.